Mulch Solutions can apply a mixture of sand and compost onto an athletic field without ever putting a piece of equipment on it. Have a bio retention pond or rain garden and can’t get to it with conventional equipment. Let Mulch Solutions deliver the material with their hose right to where it needs to go. Give us the criterion you require and we will mix and deliver and install that material on time with no damage. Mulch Solutions is great for athletic fields, rain gardens, roof top gardens, precast planters, hillsides, lawn applications and raised plant beds. Installation can be done anytime of the year, even when it is raining. Many contractors have found our services useful when they have a project with several precast planters that may only require thirty or forty yards of material. No longer are they forced to haul a skid loader to the site or use wheelbarrows to install the material. They call us. We make the blend to your specifications and in one day with no soil left on the ground install the mix in the planter. Now all you have to do is plant. It is just that easy. Need a Green Roof Mix? We are ready, willing and able to make the mix and install it! 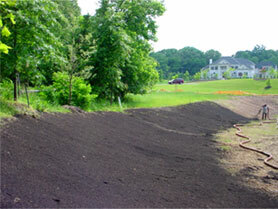 Homeowners want to get a special soil mix installed in your garden- call us – we can help.